Did you ever go away to summer camp as a child? I did. I went to multiple camps throughout my youth and would return home after a week away to find that my friends had... well, actually been doing things without me. They hadn't paused their lives just because I had been away. It was weird to return to that -- weird that my friends had inside jokes that I didn't have with them; weird that suddenly they were closer to other people than they were to me. It's an odd sensation when people begin to see you differently than they had before. It's strange to know that the people you were once close to suddenly see you as someone else -- as a stranger, almost. Emma Swan has often felt alone and estranged from people. She gave her son up for adoption. She never knew her own parents. She bounced back and forth from "family" to "family" without ever having a true sense of what that word meant. In last season's finale, Emma finally embraced Storybrooke as the place where her family lived -- the place where she was home. But "The Snow Queen" finds Ingrid utilizing the most powerful weapon in her arsenal against Emma: doubt. Doubt is like a mustard seed: it's often small, seemingly unharmful, but when dwelt upon or given power can turn into the most damaging weapon ever. Ingrid utilizes psychological warfare against Emma which is much different from the way any of our other villains (Pan, Zelena, etc.) have operated in the past. Ingrid doesn't have to hurt Emma physically in order to do damage; all she has to do is plant one small seed of doubt and Emma's mind will do the rest of the work for her. So let's talk more about this psychological warfare and the Emma/Ingrid/Elsa parallels in "The Snow Queen," shall we? Ingrid had two other sisters, Helga and Greta. All three siblings were close-knit as children and into their adolescent years. They made a pact to protect each other and, specifically, never abandon or hurt one another. Ingrid was fearful of her powers but her sisters reassured her that they would always be there, constantly loving and supporting their magical sibling. And they WERE. There are distinct (and by distinct I mean "glaringly obvious") parallels between Emma, Ingrid, and Elsa. Ingrid became hardened because of mistakes she made in her past and the fact that the people who were supposed to love her most, love her FOREVER, turned against her. Instead of seeing her as their sister, they saw her as a monster (or, well, Greta did because Helga was dead). Pain and fear are the most powerful motivators of all. They cause us to do things like shut ourselves away from the rest of the world. They cause us to lash out against others before we have the opportunity to be hurt by them. Pain and fear isolate us from the people we need most in our lives. But these two things are understandably a huge part of Emma Swan's life and just when she's started to move forward -- to accept love and family and feeling genuine happiness again -- those doubts that have plagued her throughout her entire life resurface in the form of something that is supposed to be a blessing. Elsa knows this. Ingrid knows this. Those two women know what it feels like to have other people look at you differently, hesitate to touch you because of your powers. Emma has just started to discover magic and what she can do with it. The residents of Storybrooke and her family all love her -- she's the savior, after all. She saved them. But what happens when the very thing that allowed your savior to save you in the first place is a thing that terrifies you because you cannot understand it? Ingrid makes a really interesting point when she tells Emma that Snow and Charming have always seen her as a savior first, and not their daughter. And I think that is something that really hits Emma square in the chest because, remember, she was ready at the end of the last season to pack up and leave Storybrooke because it wasn't her home. She couldn't seem to accept fully Snow and Charming as her parents; she couldn't make their story fit together with hers in her mind. It was like a disjointed puzzle almost. But as we saw in the finale, Emma was finally able to see her parents not as their fairytale counterparts but as real actual people and her real, actual family. Snow and Charming have always loved their daughter but there's also always been a disconnect there because of the fact that they placed her into the wardrobe so many years ago and sent her away. What's so delightfully complex about Ingrid is that she doesn't explicitly DO anything to harm Emma -- she merely exploits the emotions and memories that already existed. She magnifies them. She allows Emma to see that though her family and friends laud her as the savior, they also will start to fear her. And when they fear her, they will turn on her. That's a whole different kind of evil, really. Manipulation -- the quiet, subtle kind -- is the game that Ingrid plays. And the reason she does is because she was hurt by the people who loved her most. She was trapped because of her sister. She accidentally killed Helga. All those promises that the sisters made to one another turned out to mean nothing in the face of adversity and it's this warped sense of justice and protection for Emma that causes Ingrid to do what she does in "The Snow Queen." It's pretty brilliant, actually, if you think about it: Ingrid is able to take something good in Emma's life (her magical powers) and use nothing but her words to cause Emma to doubt herself and cause the people she loves most to doubt her. That's it. And then there's Elsa: if Ingrid's tale is the story of how broken promises and utter heartache can turn a good person fearful and then bitter, then Elsa's tale is a similar parallel. We see shades of Ingrid's story in the Frozen heroine's: we see how people feared Elsa for her magic, how they turned on her when she couldn't control it, how Elsa ran away in order to be alone because that is what she felt she deserved. She felt that she deserved loneliness. She and Emma are so similar in that regard, are they not? Emma and Elsa have both been hurt and have hurt others. Instead of embracing people, they lock themselves away in their own carefully constructed prisons. They push people away because they're fearful that they will hurt them or get hurt and it's this self-fulfilling prophecy, almost: because they push people away, they end up hurt. But I love that Ingrid is a villain who doesn't push people away. Hear me out, for a moment. We see Emma and Elsa fearful of their powers and vulnerable and isolated; we see that what Ingrid wants most of all is to embrace them as her family. She feels she deserves a family like them -- a little family of outcasts -- because together, they will be safe. Together, they will be happy. Together, they will be UNDERSTOOD. It's actually kind of brilliant of Once Upon A Time to provide the audience with a villain who is manipulative, but also empathetic. I want Ingrid to find people who love and accept her. I want Emma and Elsa to stop pushing others away because of their fear. So in a weird way, I want Ingrid to help them. I want her to embrace them like they deserve to be embraced. But I also know that Ingrid's means are less than desirable. I know that in the past, she hasn't meant to hurt others but now she does in order to justify her own happy ending. In "The Snow Queen," we see a very guarded side to Snow White as Emma's mother. We see shades of that fear Ingrid warned Emma would surface once her powers started to gain... well, power, for lack of a better word. 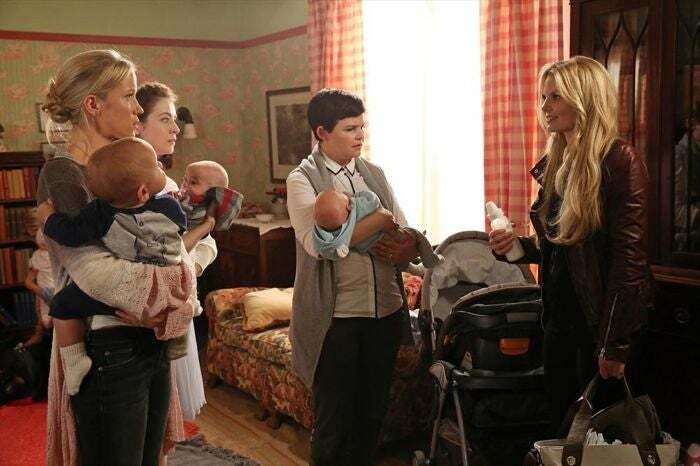 We see Snow's hesitancy in allowing Emma to hold Neal. We hear her chide Emma after accidentally unleashing her powers and hurting Charming. What's heartbreaking is that Emma sees exactly what Ingrid warned her of. Ingrid wasn't wrong -- this was bound to happen. The Snow Queen accelerated the inevitable, in her mind, in order to allow Emma to remove the rose-colored glasses she sees her family and friends through. It pained me to see everyone push Emma away in this episode. It pained me to see Snow -- a woman who should be no stranger to magic and fairytales and all of that -- push her own daughter away in order to "protect" her son. And there is some truth to what Ingrid revealed to Emma: Snow didn't get the opportunity to raise Emma and now she's trying to be a good mom (or what she believes a good mom looks like), which is understandable but also painful for Emma to watch happen. It's... it's as if Emma was the mistake child and now Snow has the chance to do it over and do everything right. I know that to not be the entire case -- Snow does very much love and care about Emma and want to protect her -- but in episodes like "The Snow Queen," it's easy for Snow to dismiss one child for the sake of protecting another. "The Snow Queen" was an episode that taught us some valuable lessons, but the most important was this: manipulation is much more powerful when it is subtle and stems from insecurities and doubts that have already existed. Those kind of battles -- the kind that exist primarily within the mind -- are the most difficult to fight and the most difficult to win. For now, it seems like Emma's insecurities and doubts and fears have resurfaced. Her walls are back up, higher and more heavily guarded than others. She's isolated herself -- literally -- from her family, Hook, and the rest of the town. Because who, really, do you turn to when everyone is afraid of you and you're afraid of yourself? MVP of the episode is a toss-up between Elizabeth Mitchell and Jennifer Morrison. I actually enjoyed the blatant parallels between Ingrid's story and Emma/Elsa's story (even if they were VERY blatant parallels). Elizabeth has managed to bring a sort of terrifying intensity with how calm and collected Ingrid is. Zelena and Pan and Regina were loud with their vengeance and their evil schemes. Ingrid is more subdued and patient which I think makes her a more compelling and scary villain. She's really stellar at this portrayal. And, as always, it was great to see Jennifer be able to tap into Emma's insecurities and her fears. This episode was wonderful because we got to see Emma terrified of HERSELF for once and the scenes in the station between her and Elizabeth were so on-point. Those exchanges were wonderfully acted, as was the culminating scene of Emma destroying the side of the building. Brava, ladies. There was some stuff about Robin Hood/Regina in this episode too but all you need to know is blah blah exposition between Robin and Will Scarlet blah blah Robin and Regina kissed and Marian is still frozen. "It's hard when they look at you differently, isn't it?" "They don't." "You're lucky." At Leakycon, there was a fan-driven OUAT panel where we discussed why in the world Storybrooke has like... no children ever seen. We saw in the first season that clearly there was a class full of kids with Henry but since then, we've seen strangely no babies. This episode remedied that with a town-wide mommy and me class. "You were tearing through that book with your scary face on." "Shouldn't it be shaking or doing something evil?" God bless Hook and his levity. "You can't love somebody you don't understand." Rumple and Ingrid closed the episode out by discussing their evil plans: Rumple can have the rest of the world as long as Inrgid gets to keep Storybrooke. Cool.